Sometimes we know the perfect words to say to our loved ones who are celebrating their special day. But other times, we run out of things to say that will remind them of how much they are loved. 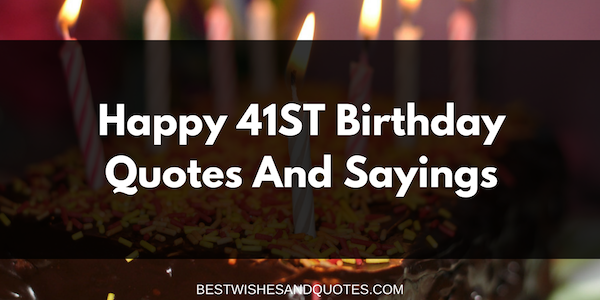 Luckily, there are a lot of great examples of Happy 41st Birthday quotes and sayings in this collection that will surely help you send your sentiments across. I know that no one can love me the way that you do. Your love for me is unconditional, and I just know that I can turn to you for anything. Thank you for being such a great mom. I love you! Have a happy 41st birthday! Mom, there may be times when we fight or when I don’t like you. But you are my mom and I will love you forever. Happy 41st birthday to the best mom in the world. You always tell me to listen to my heart whenever I’m unsure about anything or when I don’t know what to do. You always remind me that I can do whatever makes me happy, and I believe you. Thank you for being such a great mom. I love you! Happy 41st birthday! To my dearest dad, happy 41st birthday! You will always be larger than life to me. Thank you for always inspiring me to be good, kind, brave, and strong. I love you, Dad. Hi, Dad! Happy 41st birthday. I just want to tell you that I appreciate everything you do for me, even if sometimes they’re corny or weird. I understand that dads are naturally corny and cheesy. Stay happy and healthy. I wish you many more birthdays to come. Enjoy your special day! I am very blessed because I have the most incredible mother in the world. Who would believe that my mom is already 41? Stay beautiful, happy, and kind, Mom! I love you! Happiest 41st birthday to you. To the most amazing, kindhearted, generous, intelligent, and hilarious sister in the world, a very happy 41st birthday. The older you get, the better you become. Enjoy your special day and may all your dreams come true. I love you! I prayed to God that we will always be close as we grew older. God granted this prayer because we are closer than ever now. I’m so lucky to have you as my sister. I wish that all your wishes will come true this year. Happy 41st birthday! According to mom and dad, we used to wear matching clothes when we were little that the neighbors thought we were twins. Although I can’t imagine wearing matching clothes now, I still feel very blessed to have a very a close relationship with you even after all these years. Not all sisters are best friends. I’m just so glad that we are. I love you so much, big sis! Have a happy 41st birthday! There are so many things I learned from you while growing up. Not all of them good and wholesome, of course. Thank you for always having my back. I love you, bro! Happy 41st birthday! They say that life begins in your forties. There are so much to look forward to! Don’t worry, I’ll be right here with you in case you need inspiration or in case you’re running out of things to try. I love you, my dearest sister. I hope you have the most unforgettable 41st birthday celebration! To my sister and very best friend, a very happy 41st birthday. How does it feel to be 41 years old? You don’t look 41 to me. You will always be 30 years old to me. Isn’t that weird? I love you, big sis! Happy 41st birthday! You are so much more to me than just my sister. You’re also like a mother and best friend. You practically raised me, and for that I will forever be grateful to you. Thank you for all that you have done for me over the years. I love you so much and wish you all the best. Happy 41st birthday! I am so blessed because out of all the billions of sisters in the world, you are mine. I’m not even kidding when I say this, but you are truly the best sister. I love you and I wish for your continued happiness and success. Enjoy this day to the fullest. Happy 41st birthday! My wish on your birthday is that all your wishes will come true. You deserve to have all the best things in this world. I love you, my dearest sister. Happy 41st birthday! Haven’t you heard? 41 is the new 21! Let’s all drink and be merry. Happy 41st birthday to my coolest and most outrageous friend. May the years be kind to you and may all your dreams come true. Here’s to growing older and wiser together. I’m so blessed to have a great friend like you who’s generous with her time, love, and affection. I wish that we will be friends for many years and that our children will be the best of friends, too. I love you. Happy 41st birthday! So this is what 41 looks like! It totally looks good on you! I wish you all the best as you carry on your journey in your forties. Stay happy and beautiful! Happy 41st birthday, sweetheart. You are the kind of person who will be attractive at any age. If I were you, I wouldn’t worry about turning 41. You look amazing, that’s why. Happy 41st birthday, and I wish that you will always be this happy, healthy, and blessed. I love you, friend! We have been partners in crime ever since we found out our common love for the Backstreet Boys. I just know that we will be friends for many more years. And our kids will be the best of friends as well. I love you very much, sweetie! Happiest 41st birthday! To my friend who has the biggest and most generous heart, a very happy 41st birthday! May God bless you more and grant you all the desires of your heart. I love you! Have the best day with all your loved ones. We literally grew up together. Your house was just a stone’s throw away, and we did everything together. We attended the same parties, went to the same school, knew each other’s families very well, and shared each other’s darkest and most embarrassing secrets. You are family to me. I love you! Have a wonderful 41st birthday! Because of you, I had a very fun childhood. You are my best friend, and I wish that we will share many more years together. May all your dreams come true this year, sweetie. Happy, happy 41st birthday! May you sail through your life’s challenges and obstacles and achieve all your dreams. I know that you still have a lot of dreams, so don’t let being a mom and a wife prevent you from doing so! And don’t let your age stop you from chasing after your passions. Happy 41st birthday! You have always been a ray of sunshine in my life. On your birthday, allow me to show how special you are to me and just how loved you are by many. Let’s have a party to remember. Cheers to 41 years of life. Happy birthday, my friend! I am so lucky to have you as my best friend. You have been making my life so colorful for the past thirtysomething years. I love you so much. You know that, right? Happy 41st birthday! To my best buddy forever, a very happy 41st birthday. I got the beers and the food. See you later! To the best friend in the whole world, I wish you a very happy 41st birthday. May you have everything that your heart desires, and may you find all that you have been searching for. You deserve to have all these blessings. Enjoy this day to the fullest! Being your wife was the best decision I ever made in my life. I am so happy and grateful for every single moment I spend with you and for this life that we are creating together. I wish you the happiest 41st birthday. I love you so much! To the most loving, understanding, generous, beautiful, and talented wife, a very happy 41st birthday. Every year, you only grow more beautiful. I love this version of you. There’s a light in your eyes and laughter on your lips all the time. I love you! I have searched so hard for a kind of love that’s true. And then I met you and everything just fell into place. Thank you for being such a wonderful wife to me and mother to our kids. You truly are the best thing that ever happened to me. 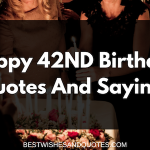 Have a wonderful 41st birthday! We have experienced the worst storms and felt the worst heartaches. You were always there to hold my hand and reassure me that everything will be alright. I don’t know what I would do without you. You are my rock and my life’s inspiration. To the man I love most dearly, a very happy 41st birthday. Thank you for asking me to be your wife and to create wonderful moments with you. I am so happy I think I’m going to burst. Cheers to another year of life and another opportunity to live and love. Happy 41st birthday! You are someone that will only grow more gorgeous as you grow older. Your fine lines and grey hairs only add to your appeal. Happy 41st birthday to the most handsome husband in the world. I love you! Cheers to another birthday, my love! You are like fine wine that only grows better with age. I love you, dearest wife. May all your wishes come true. Happy 41st birthday! You may not be as young as before, but you are definitely wiser and more beautiful inside and out. My heart will forever be yours. I love you, sweetheart. Have a happy 41st birthday. To the person who still makes me blush, my heart race, and my knees weak, a very happy 41st birthday. I love being with you, and I am so proud of the man that you have become. It makes my heart so happy to know that all our dreams coming true. Thank you for being such a great husband. I love you! To my dear wife, I just want you to know that your love is the greatest gift of all. I don’t know where I would be without you. You have been with me right from the very start, and I am the man that I am now because of you. Thank you for your love. On your 41st birthday, I wish that all your wishes will come true. I love you very much. 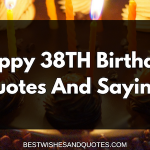 I hope that this birthday brings something new to look forward to and something wonderful to make you happy all throughout the year. May all your wishes come true, and may your dreams finally manifest in your life. I love you so much, my love. Happiest 41st birthday. Your love is like a bright shining light that inspires me to be a better person every day. Thank you for spending your life with me and for raising our beautiful children together. I love you so much, honey. My heart is yours forever. Happy 41st birthday! It’s such a blessing to be spending your birthday. I love you very much and I wish for more years of love, life, and happiness. Happy 41st birthday and may all your dreams come true. Birthdays only come once a year, so make sure that you spend some time crafting the most thoughtful and most heartwarming birthday greeting. These examples can surely inspire you and help you get the words flowing and the emotions brimming!